A win for Codema at the EESA Awards! We are delighted to announce that Codema won the Best European Energy Service Promoter category at the EESA awards in Berlin last week. 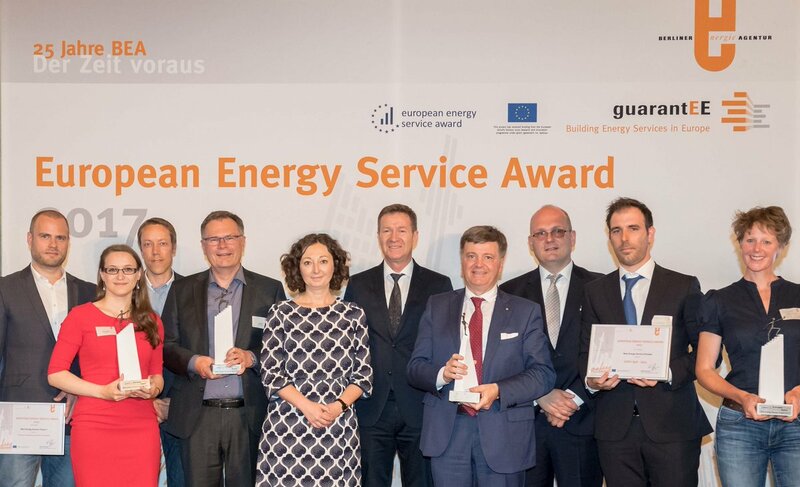 The European Energy Service Awards is a high-level awards ceremony that honours outstanding European projects and institutions in the field of energy services. Codema received the Best European Energy Service Promoter award for our role in helping Dublin City Council to implement Ireland's first local authority Energy Performance Contract (EPC), and for promoting the EPC model across Ireland. Dublin City Council's EPC project involved the energy-efficient upgrade of three of its sports and fitness centres (Ballymun, Finglas and Markievicz), and the contract was awarded to Noel Lawler Green Energy Solutions Ltd in July 2016, after a rigorous public procurement process. The works included measures such as upgrading lights to LEDs, improved building controls, and an overhaul of the CHP systems. The upgrades will result in average energy savings of 30% per building, will reduce annual energy and maintenance costs by over €100,000, and will reduce carbon emissions by 639 tonnes per year. EPC is relatively new to Ireland but is an extremely innovative way of upgrading public buildings, as it guarantees how a building will perform over the lifetime of the contract, once the measures have been implemented. In the case of Dublin City Council's project, the appointed ESCo must guarantee the energy performance of the centres throughout the lifetime of the contract, which is eight years in total. The ESCo must also maintain, and, if necessary, repair, the equipment associated with the upgrades during this time. Another central pillar of the EPC is that these savings will be measured and verified on a regular basis by Codema and the ESCo throughout the lifetime of the contract. Codema has been able to advance our knowledge of EPC through our involvement in the Horizon 2020 GuarantEE project, which fosters the use of Energy Performance Contracting in the public and private sector across Europe. Codema is absolutely delighted to win the EESA award for Best European Energy Service Promoter. The EPC model is far more innovative than the 'normal' approach to upgrading buildings in the public and private sectors. Instead of traditional methods where a contractor carries out the work with no further obligation, the EPC model ensures that the contractor must guarantee the energy performance of a building for an agreed period of time. The contractor, therefore, must also maintain the equipment and cannot walk away from an unsatisfactory job. This solution is ideal for large local authority buildings with a high energy demand. For further information on the EESA Awards, please click here.